Chalan Receive: This is the first steps of the product cycle in a pharmaceutical company. In this step, the warehouse received chalan of the product from the production department of the company. And stores the product at the warehouse to be sold. 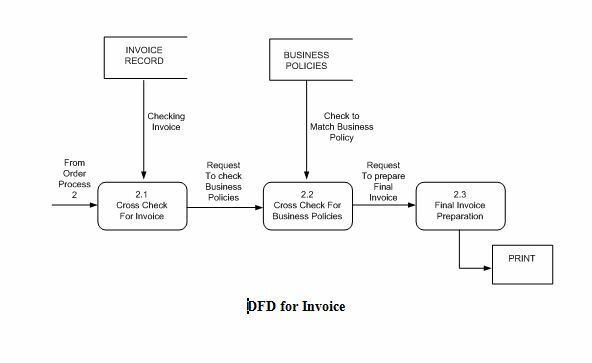 Invoice against order: This is the second steps of the product cycle in a pharmaceutical company. In this step, the warehouse received order from the customers. Then prepare an invoice against the order and after that the product is supply to the customers. Return of goods: This step of the product cycle take place, when the customer willing to return the goods that has been delivered to them. In this step, the warehouse receives the returned product from the customer and updates the customer balance and the inventory record. Not Synchronized – wrong order taking: In manual inventory management system, the order taking procedure is not synchronized that’s why sometimes wrong has been taken. This problem cause major loss of the company. To solve this problem Automated Inventory Management System is required. Steal of products: In manual inventory management system, sometimes products are stealing by the dishonest staff of the company. Field force also fraud with the company by sealing the products. To deal with this problem, there is no other ways without Computerized Inventory Management System. 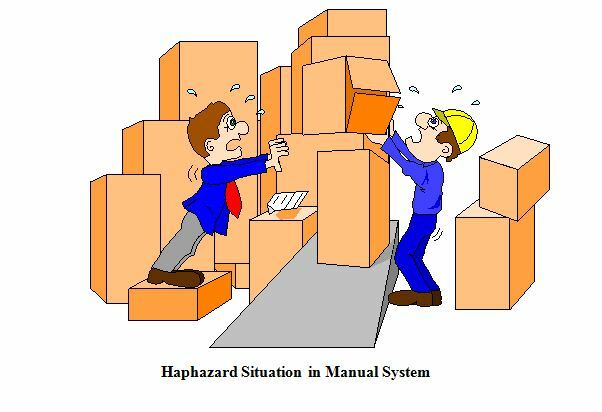 Stock information is wrong: Due to the paperwork of the manual inventory management system, The Depot manager sometimes carry wrong information about the stock. For this, the wrong information of the stock hampers the production cycle of the company problem. Collection of money from Customer is erroneous: In manual inventory management system, when collectors collect money from the customer sometimes under-billing or over-billing occurs. This problem is the major obstacles to achieve the company goal. To solve this we have to transform the manual inventory system into computerized inventory management system. Inefficient MPO Management: In manual inventory management system, the management can not efficiently handle the Medical Promotion Officer (MPO) of the company. The management can’t evaluate the performance among the MPO. For this reason sometimes several MPO are working hard, but several MPO intentionally avoid the work. To manage the MPO more effectively and efficiently we required Automated Inventory Management System. 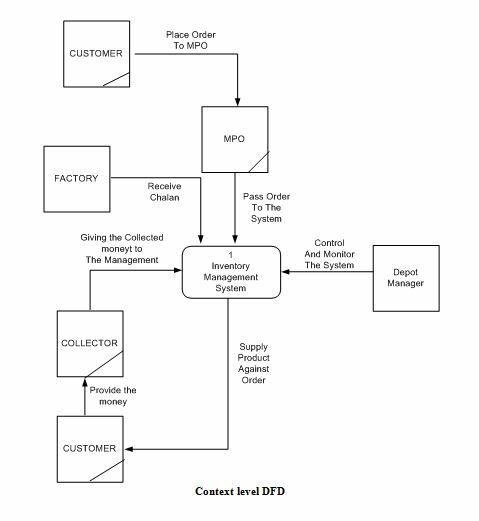 Lower level management doesn’t get detailed day-to-day information for control decisions: The manual inventory management system can’t provide efficient report to the lower level management of the company. For this reason the lower level management suffers to control DPS (Data Processing System) of the company. The shows the graph of the ABC pharmaceutical company’s under growth situation in manual inventory management system. 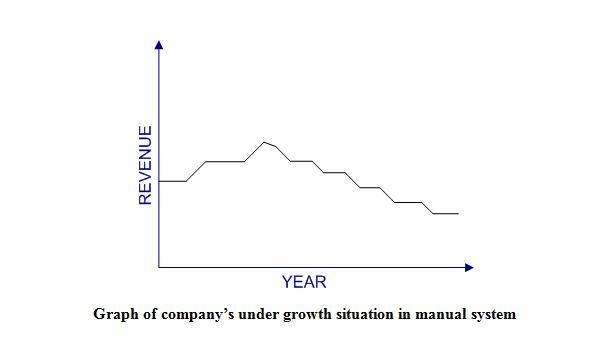 The following figure depicts the revenue of the company during the previous year. Product stock does not match the stock in the paper when auditing: When auditing take place, the number of product in the stock doesn’t match the stock in the paper. That causes a greater constraint to achieve the higher system performance. We need to solve these issues by implementing a computerized inventory management system for the company. 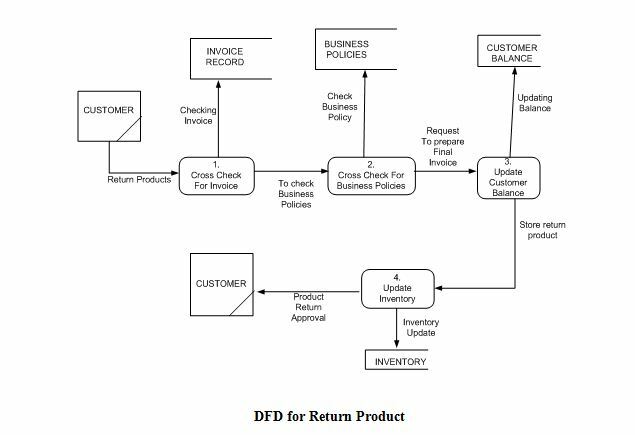 Improved product inventory management: By improving the product inventory management the Depot manager will be able to cross-check daily inventory. Cost reduction: The money and time is the main constraint of any system. In many ways – by improving Statement of constraints the management will be able to reduce the cost of the inventory management system. Improved customer service: The customer is the existence of any business organization. So, every business organization should provide the best services to catch their customer. By improving the customer services, the Customers will get better service and they will not be harassed due to misconduct. Unit costs: Unit cost is the information about the price of the item per unit i.e. ; TK/Tablet or TK/Bottle. Business policies: Business policies are the information about the business offers include discount and other offers that are provided by the management. Product name with generic: Input the generic name of the medicine such as- Paracitamol, Levocetirizine, Loratadine, Calcium etc. Cost: Product name should input along with their cost per items that means the unit price of the item i.e. ; tk/tablet or tk/bottle. Discounts in (%): Input the discount amount of the product for say if buy 100 pcs then free provide 5 pcs. 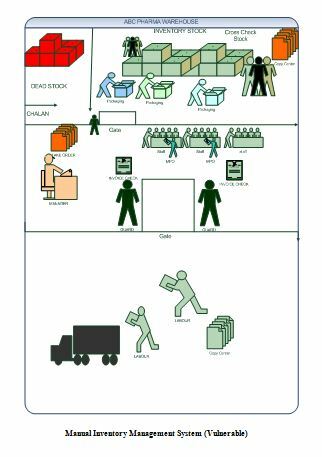 Chalan info: Input the information of the Products that Warehouse receives from Factory. Order Info: Input the order information of the customer that is the customer sought for medicines. Invoice info: Input the invoice information that includes the MPO who actually able to sale. Return info: Input returns information that includes the invoice number against which the return happened. Lost/Broken info: Entry the information of the lost/broken/expired products those are stored in the dead stock. Customer balance: Producing or updating the balance of the customer when needed. Daily Sales: Reporting the daily sales status to the user or depot manager. Daily Collection Report: Reporting the daily-wise collection information. MPO sales target: Generates Reports to the management about the sales target of the MPO. Monthly/Half-Yearly Sales Status: Generates the monthly half-yearly sales status of the company to MIS. Market-required Product: Reports the most-required product in the marketplace. The computerized inventory management system will reduce the vulnerable situation of the manual inventory management system that have already described at the. Right now I would like to describe the depot floor activities in computerized inventory management system. The illustrates the depot floor in the computerized system. In the proposed computerized system, the numbers of staffs are reduced and the total system of depot floor is more simplified. In the computerized inventory management system the depot floor activities of the ABC pharmaceutical company are work in a systematic way. The figure also depicts the reduction of paper work in the computerized system. In this new system, the depot manager controls and monitors the major activities of the system. The data entry operators input the required data to the database. Appointment: Recruiting new People for the organization. Posting: Transferring People at the different field organization such as- District or Thana Level. Terminate/ Discontinue: Terminating and discontinuing people as needed. Provide discontinuing facility with the performance of the employee. Generic: Store the generic name of the medicine such as- Paracitamol, Levocetirizine, Loratadine, Calcium etc. Product: Store the product name provided by th company such as- NAPA, LECET, ORADIN, CALBO etc. Unit Price: Store the unit price of the item i.e. ; TK/Tablet or TK/Bottle. Customer Type: Store the type of customer that is categorized into Retail, Corporate, and Regulars. Address: Store the address of the customer that is district, thana, and market. Introduction of New products and generics: The product management sub-modules of the inventory management system involves for adding new product to the database when new product launched. Unit Price: In the product management module, this requires to store the unit price of the item i.e. ; TK/Tablet or TK/Bottle. Add/edit product with their price: Adding/edit product to the database when new product launched/ when existing products information change. Updating prices into the database when any of the particular product’s prices rises or fall. Chalan Number: Each of the chalan has a chalan number that includes the quantity of the products of that chalan. Interactors – Product: In the chalan process, product and warehouse are the main interactors. Interactors – MPO, customers, products: Here MPO, customers and the products are interact in the order process. Interactors – MPO, customers, products: In the return process the MPO, Customer, and the products are interacts with each other. Reorganization of Business Offers: To convince the customer for receiving the items, provide special business offer to them. For this re-organization of business offers are required. Customer Balance Update: If the items has been return from customer then the current balance of the customer need to be update i.e. ; debit the customer balance that is equal to the amount of the return products. Update of Inventory: When the return products are added to the inventory the Inventory should be updated. Customer Status: Recognize the status of the customer. Daily Sales Collection: Collect the money according to the daily wise sales from the customer. Update of Customer Balance: After collecting the money, update the balance of the customer. Interactors – Product: In this process the product interacts with the depot manager. Product current Inventory: The Computerized Inventory Management System can generate reports about the current inventory status of the products. Existing Stock: Produces the existing stocks condition of the inventory. Chalan: Produces reports about when to require Chalan of any items with quantity. Produces reports about the total sold products at a given period of time. Other Spoils: Produces reports about the other spoils. Final Stock: Produces reports about the Final stocks of the inventory. Customer Balance: The Computerized Inventory Management System generates reports about the customer balance such as-10,000 tk or up like this. Product List: The Computerized Inventory Management System can generate reports about the lists of the items in the inventory. MPO List: The Computerized Inventory Management System can generate reports about lists of MPO works in the company. All Lists: The Computerized Inventory Management System can generate reports about any lists that are associated with the inventory management system. MPO Target/ Achievement in a month: The Computerized Inventory Management System can generate reports about target and achievement of the MPO. Customer wise Returns (Against Invoice): The Computerized Inventory Management System generates reports about the customer-wise returns against invoice. Particular Invoice: The Computerized Inventory Management System can generate reports about a particular invoice. Particular Bill against Invoice: The Computerized Inventory Management System can generate reports about a particular bill against invoice. Total Sale (Product – Price): The Computerized Inventory Management System can generate reports about the total sales products in quantity or in amount for a particular period of time. Each LCD terminal will have RFID reader; as member comes in the range of the reader, it retrieves member’s information from the membership card and displays updates on the LCD screen. Webpage will be updated by the pharmaceutical company’s intend; e-mail and SMS will be sent according to member’s preference. “We are living in a world where everyone is one call away, and everything is one click away”, is it really true? Well, the answer is “yes, almost everyone is one call away; but, not everything is one click away”. The world is moving fast, so is the information technology. What is new today, tomorrow that might be in waste-box. Computer technology has been integrated in almost every step of our lives. However, when it comes to pharmaceutical industry we are still following the traditional way (except for the online ordering) where we have to go to warehouse centre and spend half of the day just to find the required products. This is a big waste of time. We could just spend that time chatting with friends, hanging with family or working in office. In addition, sometimes we require going to several pharmaceutical company to find preferred product, which is full of hustles. It would have been better if we could just decide what exactly the MPOs are going to buy, what would be the price and so on before going to the warehouse centre.